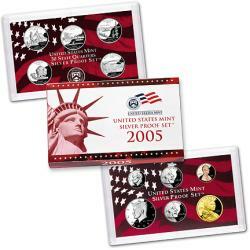 Expected to be in high demand, the 2005 U.S. Mint Silver Proof Set went on sale yesterday (June 7) at noon. The U.S. Mint will accept orders online and by telephone. The 11-coin set costs $37.95 and features proof silver versions of the five 2005 commemorative quarters in the Mint’s 50 State Quarters Program – California, Minnesota, Oregon, Kansas and West Virginia. It also features the Roosevelt dime and Kennedy half dollar in 90 percent silver and 10 percent copper alloy. Each has a distinct cameo appearance that’s created by the contrast of finely detailed frosted design devices set against a mirror-like background. Also included in the set are proof versions of the two new Jefferson nickel designs in standard copper-nickel alloy – the “American Bison” and the “Ocean In View.” Both are part of the Westward Journey Nickel Series.